CONNECTIONS™ is the only connected home event to focus on the use cases and emerging business models that will successfully engage consumers and grow revenues in the converging IoT industries - including smart home, connected entertainment, and mobile ecosystems. Connected Health Summit features Parks Associates’ in-depth consumer research as well as industry perspectives on the impact of connected devices, mobile health services, and health reforms. CONNECTIONS™ Europe is an expert executive summit featuring the latest consumer research on digital living technologies around the world. Future of Video: OTT, Pay TV, and Digital Media features new consumer research and insights on the changing video and digital media markets. CONNECTIONS™ Summit features sessions focusing on trends, emerging business models and technologies, and growth opportunities for companies developing products and services for the digital home. 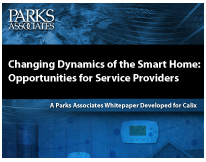 The event focuses on the emerging in-home energy management technology market, offering consumer and industry research and strategic insight. Jun 28-30, 2011 CONNECTIONS™: The Digital Living Conference and Showcase Santa Clara, Calif.
Jan 24-26, 2011 Smart Energy Summit: Engaging the Consumer Austin, Tex. Jun 8-10, 2010 CONNECTIONS™: The Digital Living Conference & Showcase Santa Clara, Calif.
Jan 25-27, 2010 Smart Energy Summit: Engaging the Consumer Austin, Tex. Jun 2-4, 2009 CONNECTIONS™: The Digital Living Conference & Showcase Santa Clara, Calif.
Jun 24-26, 2008 CONNECTIONS™: The Digital Living Conference & Showcase Santa Clara, Calif.
May 1-3, 2007 CONNECTIONS™: The Digital Living Conference & Showcase Santa Clara, Calif.
May 2-4, 2006 CONNECTIONS™: The Digital Home Conference & Showcase Santa Clara, Calif.